(iv) Number of workers employed in the enterprise. (c) GDP is the total value of ……… produced during a particular year. (iv) All intermediate and final goods and services. (d) In terms of GDP the share of tertiary sector in 2003 is ………. (d) (iii) between 50 per cent to 60 per cent. Answer 3 1. (d), 2. (c), 3. (e), 4. (a), 5. (b). Question 4. Find the odd one out and say why. (iv) MTNL, Indian Railways, Air India, SAHARA Airlines, All India Radio. Answer 4 (i) Tourist guide. He is appointed by the government, while dhobi, tailor and potter belong to the private sector. (ii) Vegetable vendor. He does not require a formal education. (iii) Cobbler. The rest are workers in the public sector, while his profession is a part of the private sector. (iv) SAHARA Airlines. It is a private enterprise, while the rest are government undertakings. Complete the table. 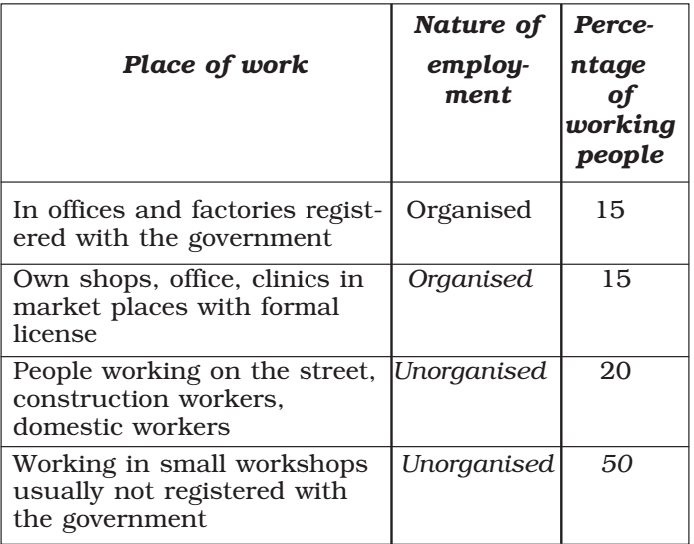 What is the percentage of workers in the unorganised sector in this city? The percentage of workers in the unorganised sector in this city is 70. Question 6. Do you think the classification of economic activities into primary, secondary and tertiary is useful? Explain how? (i) On account of the information it provides we come to know how and where the people of a country are employed. (ii) It helps in ascertaining as to which sector of economic activity contributes more or less to the country’s GDP and per capita income. (iii) If the tertiary sector is developing much faster than the primary sector, then it implies that agriculture is depleting, and the government must take measures to rectify this. The knowledge that the agricultural profession is becoming unpopular or regressive can only come if we know which sector it belongs to. Hence, it is necessary to classify economic activities into these three basic sectors for smooth economic administration and development. Question 7 For each of the sectors that we came across in this chapter why should one focus on employment and GDP? Could there be other issues which should be examined? Discuss. (a) These determine the size of a country’s economy. (b) Helps determine two important things—per capita income and productivity. (c) In each of the three sectors, employment rate and status as well as its contribution to the GDP help us understand how that particular sector is functioning and what needs to be done to initiate further growth in it. Question 8. Make a long list of all kinds of work that you find adults around you doing for a living. In what way can you classify them? Explain your choice. Answer 8 If we look around ourselves we will find people engaged in various economic activities producing goods and services like teacher, doctor, vegetable vendor, lawyer, postman, cobbler, soldier, police constable, tourist guide, dhobi, tailor, potter etc. Question 9. How is the tertiary sector different from other sectors? Illustrate with a few examples. Answer 9 Tertiary sector is different from the other sectors because this sector does not produce goods but they are an aid or support for the production process. Since these activities generate services rather than goods, the tertiary sector is also called service sector. It helps in development of primary and secondary sectors. Examples: (a) Transportation—Goods that are produced in the primary sector need to be transported by trucks or trains and then sold in the wholesale and retail shops. (b) Storage—At times it is necessary to store these products in godowns, which is also a service made available. (d) Banking—Borrowing money from the banks. Question 10. What do you understand by disguised unemployment? Explain with an example each from the urban and rural areas. Answer 10 . Disguised unemployment is a situation, where people are apparently working but all of them are made to work less than their potential. If a few people move out, it will not affect the production. It is hidden in contrast to the open unemployment where a person is clearly or visibly without job. In rural areas, this can be seen in the farming community where all members of a family might be working on a farm even though so many hands are not required. They do so because of lack of another job. In urban areas, disguised unemployment can be seen in the service sector where painters, plumbers, repair persons and others are doing odd jobs. Many of them don’t find work everyday. Question 11. Distinguish between open unemployment and disguised unemployment. Ans. Differences between open unemployment and disguised unemployment. 1. It is a situation, where people are apparently working but all of them are made to work less than their potential. 1. It is a situation, when a person has no job in hand and does not earn anything at all. 2. It is hidden. 2. It is clearly visible. 3. If a few people move out, it will not affect the production. 3. The more the people will be unemployed, the more it will affect production. Question 12. “Tertiary sector is not playing any significant role in the development of Indian economy.” Do you agree? Give reasons in support of your answer. Answer 12 No, it’s not true. In fact tertiary sector is playing a significant role in the development of the Indian economy. The tertiary sector has contributed vastly to the Indian economy, especially in the last two decades. In the last decade, the field of information technology has grown, and consequently, the GDP share of the tertiary sector has grown from around 40% in 1973 to more than 50% in 2003. It helps in the development of primary and secondary sectors. Though it does not produce goods but they are an aid or support for the production processes. Question 13 Service sector in India employs two different kinds of people. Who are these? Answer 13 At one end, there are a limited numbers of services that employ highly skilled and educated workers. At the other end, there are a very large number of workers engaged in services such as small shopkeepers, repair workers, transport persons, etc. These people hardly manage their livelihood. Question 14 Workers are exploited in the unorganised sector. Do you agree with this view? Give reasons in support of your answer. Answer 14 Yes, I do agree with the view that workers are exploited in the unorganised sector. The unorganised sector is characterised by small and scattered units which are largely outside the control of the government. There are rules and regulations but these are not followed. Jobs here are low-paid and often not regular. Question 15 How are the activities in the economy classified on the basis of employment conditions? 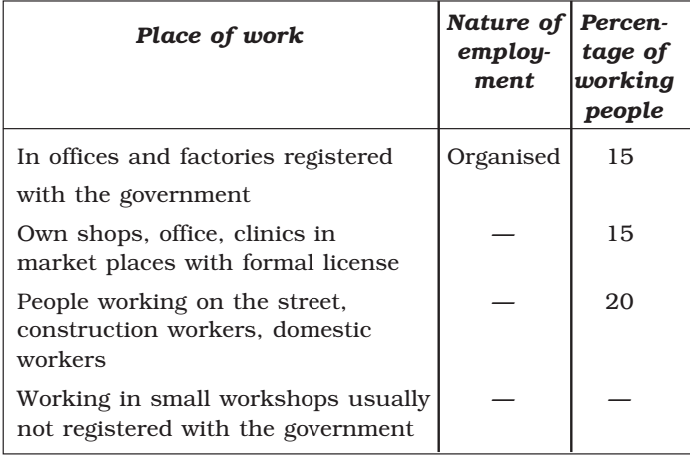 (i) Organised sector: It is the one where the terms of employment are regular and people have assured work. It is registered by the government and follows its rules and regulations which are given in various laws. Workers in the organised sector enjoy security of employment. (ii) Unorganised sector: These are small and scattered units which are largely outside the control of the government. There are rules and regulations but these are not followed. Jobs here are low-paid and often not regular. Question 16. Compare the employment conditions prevailing in the organised and unorganised sectors. 1. It is the one where the terms of employment are regular and people have assured work. 1.People have no assured work. They can be removed any time. 2. They are registered by the government and have to follow its rules and regulations which are given in various laws such as the Factories Act, Minimum Wages Act, etc. 2.It is largely outside the control of the government.There are rules and regulations but these are not followed. 3. It is called organised because it has some formal processes and procedures. 3.There are no formal processes or procedures. 4. Workers in the organised sector enjoy security of employment. They are expected to work only a fixed number of hours. If they work more, they have to be paid overtime by the employer. 4.Workers in the unorganised sector do not enjoy security of employment. 5. They also get several other benefits from the employers like paid leave, payment during holidays, provident fund, pensions, gratuity, medical benefits etc. 5.There is no provision for overtime, paid leave holidays, leave due to sickness etc. Question 17. Explain the objective of implementing the NREGA 2005. Answer 17 All those who are able to and in need of work will get guaranteed 100 days work and if the government fails to do so, it will give unemployment allowances to them. The types of work that would in future help to increase the production from land will be given preference under this Act. Question 18. Using examples from your area compare and contrast the activities and functions of private and public sectors. 1) In public sector, the government owns most of the assests and provides all the services. These industries aim for social welfare and give all kinds of facilities to their workers which they deserve to get. 1) In a private sector, ownership of assets and delivery of services is in the hands of the private individuals or companies. Example: Tata Iron and Steel Company Limited. 2) These enterprises are mainly concerned to profit motive. Question 19. Discuss and fill the following table giving one example each from your area. Question 20. Give a few examples of public sector activities and explain why the government has taken them up. Answer 20 . A few examples include provision of water, electricity and some modes of transport. The government has taken these up because water and power are the basic needs of every individual. If the work of providing electricity and water is left to private enterprises, the latter might exploit this opportunity and sell these at rates which the masses cannot afford. Hence, to ensure that basic amenities like water and power are available for all, the government supplies these at low and affordable rates and ensures its uninterrupted supply to public. Question 21. Explain how public sector contributes to the economic development of a nation? Answer 21 In the public sector, the government owns most of the assests and provides all services. Public sector industries aim for social welfare and give all kinds of facilities to their workers which they deserve to get. It plays a vital role in contributing to the Human Development Index via its functioning in health and education services. Running proper schools and providing quality education, particularly elementary education, is the duty of the government. The government pays attention to the aspects of human development such as availability of safe drinking water, housing facilities for the poor and food and nutrition. Also, by buying food grains at a “fair price” from farmers, providing electricity, water, postal services at low rates, the government ensures that the people have a good living. Question 22 The workers in the unorganised sector need protection on the following issues: wages, safety and health. Explain with examples. Answer 22 • Wages: Workers in the unorganised sector are often exploited and not paid a fair wage. As their wages are low, they need protection. They must be given fair wages so that they may support their family comfortably. • Safety: There are several workers who have to work in mines or crackers factory to earn their livelihood. Thus, they face great risk, which should be paid attention. • Health: Long working hours and unhygienic working conditions pose great problems to the health of the workers. Question 23. A study in Ahmedabad found that out of 15,00,000 workers in the city, 11,00,000 worked in the unorganised sector. The total income of the city in this year (1997- 1998) was 60,000 million. Out of this 32,000 million was generated in the organised sector. Present this data as a table. What kind of ways should be thought of for generating more employment in the city? In order to generate more employment in the city more companies need to be brought under organised sector so that workers from the unorganised sector may get jobs there, with higher and more secure wages. For this, the government must provide loans and aid to companies transferring from unorganised to organised sectors. (i) Calculate the share of the three sectors in GDP for 1950 and 2000. (ii) Show the data as a bar diagram similar to Graph 2 in the chapter. (iii) What conclusions can we draw from the bar graph? (iii) We can draw the conclusion that the share of the tertiary sector in the GDP has almost doubled, while that of the primary sector has almost halved. The secondary sector has grown by about 10% in the last five years.